THE people of Royersford are feeling pinched. In the Main Street Café, in the town centre, a man complains that his pension payments will soon be frozen. Sheena, a waitress, says business is brisk, but rues the “teeny tiny” pay rises she and her friends have received. The worries of those in this Pennsylvanian borough are familiar across America. Although it has chugged along far better than other rich countries, the world’s largest economy still fails to instil confidence in its workers. Add to this sour economic data from the beginning of 2015, and some question the strength of the American recovery. Wages hold the answer. GDP is made up of four things: government expenditure, net exports, investment and consumer spending. One component, government largesse, is doing better. After years of weighing on growth, higher spending is now helping the economy. The other components tell another story. Start with exports (see chart 1). On a trade-weighted basis, the dollar has appreciated by 13% in the last year. America is not especially exposed to the vagaries of international trade—exports of goods and services equal just 14% of GDP, compared with 26% for the euro zone. But the dollar’s recent rise, which makes American products less competitive on world markets, has been so dramatic that problems are emerging. Paul Ashworth of Capital Economics, a consultancy, is expecting a 14% annualised, inflation-adjusted decline in exports over the first quarter of this year. With the euro zone expected to grow by just 1.4% this year, and the Canadian economy also slowing, demand for American wares from important trading partners threatens to be lacklustre. Businesses are already feeling the pain. A third of the sales of companies in the S&P 500 index come from abroad. Corporate profits fell by 1.6% in the fourth quarter of 2014 and were 6.4% lower than in the same quarter of 2013. As profits have been squeezed, so investment, the third component of GDP, has stalled. All this sounds bad. However, the American economy lives or dies by what happens to consumer spending, which makes up the lion’s share of GDP. If buoyant, it could prevent the economic blip from turning into something more serious. Economists had expected strong consumption growth in 2015: Americans have seen a windfall from a halving of the price of oil and outstanding consumer credit has grown for 42 straight months. Despite that, consumption growth has slipped. Unusually bad weather earlier this year partly explains what is going on. A freezing winter forced Americans to stay indoors instead of going to the shops. But the biggest thing working against stronger and more sustainable consumption growth is pay. 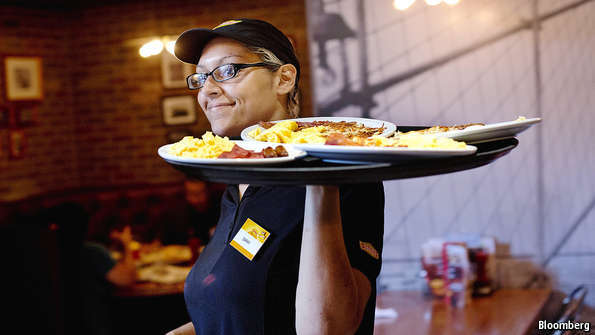 In Royersford’s part of Pennsylvania, real hourly earnings fell by 1% last year. Down the road from the café (and past a few vacant lots) in Sweet Ashley’s Chocolate, the shop’s owner says that she would like to hire, but can only afford to pay the minimum wage. One of her friends has three jobs, one of them full-time, to make ends meet. Across America, median inflation-adjusted wages are no higher today than they were when the financial crisis hit (see chart 2). Economists struggle to explain why wages have not taken off. The most recent jobs report, for March, was muted, but that served to highlight just how robust the data have been over the past two years. The unemployment rate stands at 5.5%, below its historical average. Economists expect that wages should rise faster in such circumstances, since employers have to compete for workers. A research paper from the Federal Reserve Bank of Chicago estimates that, if real wage growth had followed its historical relationship with the unemployment rate, by mid-2014 it would have been 3.6 percentage points higher than it actually was. Three big things, though, have held back pay: changes to America’s unemployment-insurance system, the behaviour of firms, and the persistence of labour-market “slack”. America’s unemployment-insurance system underwent a big change at the end of 2013. Before then, the average American could get 53 weeks’ worth of unemployment benefits; in three states they could get 73 weeks’ worth. Congress then decided to make benefits stingier: the average limit dived to 25 weeks, cutting off 1.3m Americans immediately. With nothing to fall back on, the wage expectations of many unemployed people fell, says Iourii Manovskii of the University of Pennsylvania. Employers in some sectors quickly took advantage of this newly cheap pool of workers. A big chunk of the 3m extra jobs created during 2014 were in poorly paid industries (see chart 3). Even firms in typically well-paying sectors are being tight-fisted with their workers. A recent paper by Mary Daly and Bart Hobijn, both of the Federal Reserve Bank of San Francisco, looks at the problem of “nominal-wage rigidity”. The paper argues that when the financial crisis hit, employers found it difficult to reduce the cash value of the wages paid to their staff. (Foisting a pay cut on your entire workforce hardly boosts morale.) Inflation was too low to take a big bite out of real wages by keeping nominal wages flat. Instead, employers fired their least productive workers, keeping the best ones happy. That helps to explain why, counterintuitively, median wages did well even as unemployment shot up. Now, to compensate for the high wages paid to those staff that got through the recession, firms are willing to offer new recruits only low wages. The survivors do not see raises, either. reasons” (PTER)—fell much more slowly than the official unemployment rate following the recession (see chart 4). The same goes for “discouraged” workers, those who want a job but say that there is no point in looking. Though few in number, their involvement—or not—in the labour market can sway wages. Both measures have fallen since the recession ended, but are still much higher than before the crisis. According to a Chicago Fed paper, the PTER rate is a particularly important determinant of wage levels. It finds that a 1% increase in the PTER rate is associated with a 0.4% fall in real wage growth, even after controlling for the effects of other measures of unemployment. The impact is especially strong for worse-off workers. David Blanchflower of Dartmouth College and Andrew Levin of the IMF found similar results in a paper published in March. When the PTER rate is high, workers may feel unable to ask for higher wages, since what they really want is more hours. Nervousness about asking for more pay may ripple through the labour market, says Daniel Aaronson of the Chicago Fed. Economists also debate the effect of America’s “participation rate”, defined as the number of people in work or actively looking for jobs as a proportion of the population over 16. Now at 62.7%, it has been falling for over a decade. It is 3 percentage points lower than in mid-2009. Some economists argue that a low participation rate is bad for wages. A pool of idle workers, though not officially looking for jobs, stops those in work from pushing for better pay, since they are worried that their employers will replace them. And if wages do rise, those out of the labour force can simply rejoin it, pushing them back down. However, this assumes that low labour-force participation is down to economic conditions. A paper by the Brookings Institution, a think-tank, disputes this. It posits that the falling participation rate among working-age people mainly reflects structural factors, such as technological changes that push some workers out of the labour market permanently. The Brookings research also tackles the question of why the participation rate fell so sharply around 2007-08. The recession had an impact, but demographic factors may have been more important. About that time, the first baby-boomers turned 62, the minimum age to receive retirement benefits. Using similar reasoning, the paper suggests that the participation rate will fall further in coming years. If its explanation is right, then as the economy improves wages should grow, since there will be fewer workers willing to be sucked back in to the labour force. If so, the latest data suggest pay could be about to take off. One survey found that 70% of American companies expected to increase wages by at least 3% in the year from March. Pay rises are hitting the headlines: McDonald’s boosted the wages of its burger-flippers on April 1st. Where big business leads, others will follow. The boss of Comfort Keepers, a social-care provider a short drive from Royersford, notes employees at Walmart, a supermarket, are getting a pay rise, a move he may be forced to emulate. David Doyle of Macquarie, a bank, says that the change in average hourly earnings of private-sector workers during the first quarter of this year was the fastest since the recession. If healthier wage data keep coming, interest-rate rises from the Federal Reserve will soon follow. 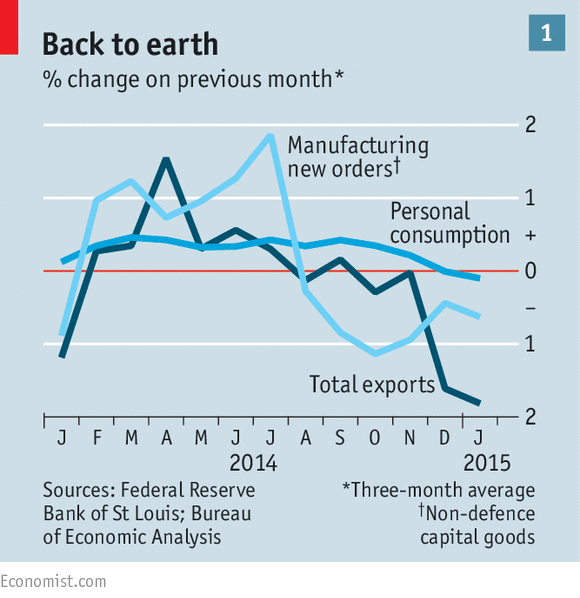 That would suggest that America’s economy, despite the blip, is on the way back to normal. In Code Red I wrote a great deal about trade imbalances among the various European countries, which were at the heart of the European sovereign debt problem. As the peripheral countries have tried to rebalance their trade deficits with Northern Europe and especially with Germany, they have seen their relative wages fall and deflation become a problem. Greece is the poster child. The north-south imbalance in the Eurozone is still a problem today. In this week’s Outside the Box, I highlight a recent blog on that topic from none other than former Fed Chairman Ben Bernanke. He first published his blog on March 30, and it appears he is going to post to three times a week. It’s a very thoughtful commentary, and I will admit to having subscribed. He is going back to his “professor” style and communicates very clearly. I find it useful to get a handle on what the economic elite are thinking and discussing, and Bernanke’s blog is going to be one of the ways I can keep up. His ongoing debate with Larry Summers over secular stagnation is fascinating, although I think they both miss the point on structural growth. Monetary policy and fiscal policy lag behind other drivers of growth in terms of importance. That fact was brought home to me at lunch today, when Woody Brock met me over at Ocean Prime for some fish and wisdom. Woody is simply one of the smartest economists on the planet and knows the gamut of the literature as well as anyone. “It’s the incentive structure that is the driver,” he told me; “that’s what I was trying to explain in my recent debate with Larry Summers.” There are times when I wish I could just be a fly on the wall, and that would have been one of them. Everyone responds to incentives, no matter what the country or type of government. Setting incentives to maximize entrepreneurial activity will produce the most growth and jobs. Of course, it is always a balancing act. It is my day for friends coming to Dallas. Tonight Steve Moore (WSJ and now with the Heritage Foundation) is in town for a speech, and he is hanging around to go to the Dallas Mavericks game with me. We’ll talk productivity and politics over steaks at Nick and Sam’s before we head to the game and again after the game at his hotel, where, randomly, my doctor, Mike Roizen (chief wellness officer at the Cleveland Clinic) is also staying the night for a speech. So a little health and politics late at night. What a great day. You have a great week as well, and think through what Bernanke is saying. Do you really think Germany will follow through on his suggestions, as reasonable as they are? Me neither. Europe is well and truly hosed. They have just not figured out yet that they need to hit the reset button. Not just on monetary or fiscal policy (which are secondary), but on the entire incentives (regulations and labor-reform) environment. In a few weeks, the International Monetary Fund and other international groups, such as the G20, will meet in Washington. When I attended such international meetings as Fed chairman, delegates discussed at length the issue of “global imbalances”—the fact that some countries had large trade surpluses (exports much greater than imports) and others (the United States in particular) had large trade deficits. (My recent post discusses the implications of global imbalances from a savings and investment perspective.) China, which kept its exchange rate undervalued to promote exports, came in for particular criticism for its large and persistent trade surpluses. However, in recent years China has been working to reduce its dependence on exports and its trade surplus has declined accordingly. The distinction of having the largest trade surplus, both in absolute terms and relative to GDP, is shifting to Germany. In 2014, Germany’s trade surplus was about $250 billion (in dollar terms), or almost 7 percent of the country’s GDP. That continues an upward trend that’s been going on at least since 2000 (see below). Why is Germany’s trade surplus so large? Undoubtedly, Germany makes good products that foreigners want to buy. For that reason, many point to the trade surplus as a sign of economic success. But other countries make good products without running such large surpluses. There are two more important reasons for Germany’s trade surplus. First, although the euro—the currency that Germany shares with 18 other countries—may (or may not) be at the right level for all 19 euro-zone countries as a group, it is too weak (given German wages and production costs) to be consistent with balanced German trade. In July 2014, the IMF estimated that Germany’s inflation-adjusted exchange rate was undervalued by 5-15 percent (see IMF, p. 20). Since then, the euro has fallen by an additional 20 percent relative to the dollar. The comparatively weak euro is an underappreciated benefit to Germany of its participation in the currency union. If Germany were still using the deutschemark, presumably the DM would be much stronger than the euro is today, reducing the cost advantage of German exports substantially. Second, the German trade surplus is further increased by policies (tight fiscal policies, for example) that suppress the country’s domestic spending, including spending on imports. In a slow-growing world that is short aggregate demand, Germany’s trade surplus is a problem. Several other members of the euro zone are in deep recession, with high unemployment and with no “fiscal space” (meaning that their fiscal situations don’t allow them to raise spending or cut taxes as a way of stimulating domestic demand). Despite signs of recovery in the United States, growth is also generally slow outside the euro zone. The fact that Germany is selling so much more than it is buying redirects demand from its neighbors (as well as from other countries around the world), reducing output and employment outside Germany at a time at which monetary policy in many countries is reaching its limits. Persistent imbalances within the euro zone are also unhealthy, as they lead to financial imbalances as well as to unbalanced growth. Ideally, declines in wages in other euro-zone countries, relative to German wages, would reduce relative production costs and increase competitiveness. And progress has been made on that front. But with euro-zone inflation well under the European Central Bank’s target of “below but close to 2 percent,” achieving the necessary reduction in relative costs would probably require sustained deflation in nominal wages outside Germany—likely a long and painful process involving extended high unemployment. Systems of fixed exchange rates, like the euro union or the gold standard, have historically suffered from the fact that countries with balance of payments deficits come under severe pressure to adjust, while countries with surpluses face no corresponding pressure. The gold standard of the 1920s was brought down by the failure of surplus countries to participate equally in the adjustment process. As the IMF also recommended in its July 2014 report, Germany could help shorten the period of adjustment in the euro zone and support economic recovery by taking steps to reduce its trade surplus, even as other euro-area countries continue to reduce their deficits. Germany has little control over the value of the common currency, but it has several policy tools at its disposal to reduce its surplus—tools that, rather than involving sacrifice, would make most Germans better off. Here are three examples. Investment in public infrastructure. Studies show that the quality of Germany’s infrastructure—roads, bridges, airports—is declining, and that investment in improving the infrastructure would increase Germany’s growth potential. Meanwhile, Germany can borrow for ten years at less than one-fifth of one percentage point, which, inflation-adjusted, corresponds to a negative real rate of interest. Infrastructure investment would reduce Germany’s surplus by increasing domestic income and spending, while also raising employment and wages. Raising the wages of German workers. German workers deserve a substantial raise, and the cooperation of the government, employers, and unions could give them one. Higher German wages would both speed the adjustment of relative production costs and increase domestic income and consumption. Both would tend to reduce the trade surplus. Germany could increase domestic spending through targeted reforms, including for example increased tax incentives for private domestic investment; the removal of barriers to new housing construction; reforms in the retail and services sectors; and a review of financial regulations that may bias German banks to invest abroad rather than at home. Seeking a better balance of trade should not prevent Germany from supporting the European Central Bank’s efforts to hit its inflation target, for example, through its recently begun quantitative easing program. It’s true that easier monetary policy will weaken the euro, which by itself would tend to increase rather than reduce Germany’s trade surplus. But more accommodative monetary policy has two offsetting advantages: First, higher inflation throughout the euro zone makes the adjustment in relative wages needed to restore competitiveness easier to achieve, since the adjustment can occur through slower growth rather than actual declines in nominal wages; and, second, supportive monetary policies should increase economic activity throughout the euro zone, including in Germany. I hope participants in the Washington meetings this spring will recognize that global imbalances are not only a Chinese and American issue. WASHINGTON—The head of the International Monetary Fund warned Thursday that the era of low interest rates risks fueling asset bubbles around the world. At the same time, she called for more central bank easing given an even bigger risk: the prospect of a long period of weak global growth. IMF Managing Director Christine Lagarde said the global economy risks a protracted economic slowdown as policy makers fail to take appropriate action to spur output. “Today what we must do is avoid that [the] new mediocre becomes the ‘new reality,’” Ms. Lagarde said in a speech to the Atlantic Council ahead of next week’s semiannual meetings of the IMF and World Bank. “All policy space and levers must be utilized,” she said. While global growth is running at roughly the average of the last three decades, Ms. Lagarde said that isn’t enough to surmount stubbornly high jobless rates, hefty debt burdens and stagnating growth in several of the world’s largest economies. She said the IMF’s economists expect stronger growth in the U.S. and U.K. and improving prospects for the Eurozone. But their updated global economic forecast, scheduled to be released Tuesday, will downgrade the growth outlook for many major emerging-market economies including Brazil and Russia. China is also expected to slow further, but the fund said the rate of expansion is better for the economy’s longer-term prospects. Gloomy global prospects, combined with a financial system still scarred from the 2008 crisis, aging labor forces and weakening productivity levels around the world, creates “a pretty toxic combination and we need to encourage policy makers to take the right decisions,” she said later on CNBC. Amid the weak growth outlook, Ms. Lagarde said financial risks to the global economy were rising, particularly amid a prolonged era of low-and in some cases negative-interest rates. “These foster a higher risk tolerance on the part of investors, which can lead to overpricing,” she said. If low interest rates persist, she said life insurers and defined benefit pension funds could soon face solvency challenges. Strong currency movements-particularly the surge of the U.S. dollar against the euro and yen as central banks in Europe and Japan flood their economies with cheap cash-are also a threat to emerging-market economies that have borrowed in the greenback and face falling commodity revenues. Adding to their problems, borrowing costs are expected to rise and many emerging-market firms have failed to hedge their currency exposures, she said. Although stronger rules and oversight have made the traditional banking sector safer since the financial crisis, risks to the system have migrated to the more opaque and less-regulated financial industry. That requires new regulations to rein in burgeoning risks, the fund says. But the threat of prolonged low growth overshadows those risks for the IMF. That is why Ms. Lagarde says the European Central Bank and Bank of Japan should continue their easy-money policies. Countries with room to spare in their budgets and that don’t have major debt overhangs should spend more to boost demand in the near-term, including on infrastructure, she said. Authorities in both advanced and emerging-market nations need to overhaul their economies to spur growth potential and fuel investment to boost longer-term growth prospects and encourage investment, she said. Ms. Lagarde pointed in particular to the eurozone, Japan, China and Brazil. And she also backed negotiations to revive declining global trade. “There are potentially huge global gains to be had from further trade reform and integration,” she said. To preserve the longer-term stability of the global economy, Ms. Lagarde said global powers need to strengthen the policy forums that make up the international financial architecture. That means the U.S. needs to ratify a five-year-old deal to overhaul the IMF’s governance that would give emerging-market economies, notably China, more power at the fund in line with their growing economic heft in the world, the IMF chief said. It also means stronger collaboration with regional financial institutions, including the new Chinese-led Asian Infrastructure Investment Bank, she said. The new bank represents the changing landscape of the global economic order, she said. 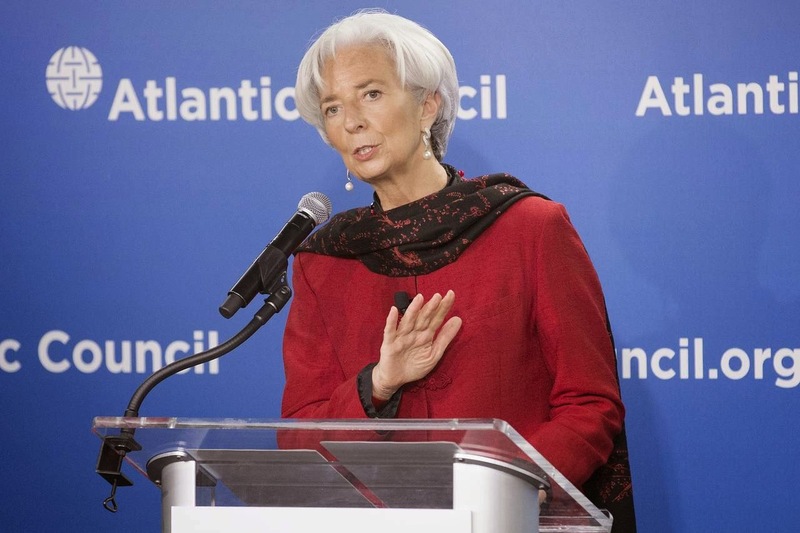 And Ms. Lagarde signaled she might back inclusion of China’s yuan in the IMF’s basket of reserve currencies. “Strengthening the resilience of the international financial architecture would include…increasing the role of the [IMF’s lending currency] as a global reserve asset and facilitating the integration of dynamic emerging markets into the global economy,” she said. LAGUNA BEACH – Like many readers, I still vividly recall when Nokia was the dominant player in mobile phones, with over 40% of the market, and Apple was just a computer company. I remember when Amazon was known only for books, and when dirty taxis or high-priced limousines were the only alternative to public transport or my own car. And I recall when the Four Seasons, Ritz Carltons, and St. Regises of this world competed with one another – not with Airbnb. Now, I may be old, but I am not that old. These changes happened recently – and fast. How did they occur? Will the pace of change remain so rapid – or even accelerate further? And how should companies respond? An industry can be transformed by top-down economic, financial, political, and regulatory changes. But companies like Airbnb, Amazon, Apple, and Uber exemplify a different kind of transformation: agile players invade other, seemingly unrelated industries and brilliantly exploit huge but previously unseen opportunities. Importantly and counter-intuitively, doing so serves their own core competencies, rather than those of the industry that they seek to disrupt. Indeed, rather than using existing approaches and processes to compete, these entrants created radical new game plans, rewriting the target industry’s rules. Their creativity and passion enabled them to subdue – and in some cases even destroy – less adaptable giants remarkably quickly. Central to these companies’ success has been their understanding of a fundamental trend affecting nearly all industries: individual empowerment through the Internet, app technology, digitalization, and social media. Most traditional companies, meanwhile, remain focused on their macro environment, at the expense of responding adequately to the new micro-level forces in play. If existing companies hope to compete in this new environment, shaped by both top-down and bottom-up forces, they will to have to adapt, preempting disruptive new players by figuring out how to disrupt themselves. Otherwise, they could face a fate similar to Nokia, which was disintermediated by one tech company (Apple) and acquired by another (Microsoft). In this effort, companies must recognize that both demand and supply factors are or will be driving the transformation of their competitive landscapes. On the demand side, consumers expect a lot more from the products and services they use. They want speed, productivity, and convenience. They want easy connectivity and expanded scope for customization. And, as the success of services like TripAdvisor show, they want to be more engaged, with companies responding faster to their feedback with real improvements. On the supply side, technological advances are toppling long-standing entry barriers. The online car service Uber adapted existing technologies to transform a long-sheltered industry that too often provided lousy and expensive service. Airbnb’s “supply” of rooms far exceeds anything to which traditional hotels could reasonably aspire. An existing company would have to be highly specialized, well protected, or foolish to ignore these disruptions. But, while some well-established companies in traditional industries are already looking for ways to adapt, others still need to do a lot more. One traditional industry in which progress is being made is the automotive branch, where companies are pursuing digitalization. Though new entrants could undoubtedly disrupt incumbents’ production platforms – Elon Musk’s Tesla Motors is a clear example – they are rare. These days, the more pervasive competitive threat comes from companies in other domains that can erode the customer value proposition after the car is sold. Automotive companies are recognizing that, over time, the digital experience in the cars they produce will command a larger share of the consumer surplus, owing largely to the potential for substantial profit margins and economies of scale. As a result, they are adapting their vehicles to the new sharing economy, helping people to remain well-connected in the car, expanding the scope of after-sale services, and preparing for the shift away from individual car ownership toward car sharing. Banks are also adapting, but much more slowly and hesitantly. If they are to make progress, they must move beyond simply providing apps and online banking. Their aim should be holistic engagement of clients, who seek not only convenience and security, but also more control over their financial destiny. In these and many other industries, the competitive landscape is undoubtedly becoming more complicated and unpredictable. But four general guidelines can help managers effectively adapt their mindsets and business models to facilitate orderly and constructive self-disruption. · First, companies should modernize core competencies by benchmarking beyond the narrow confines of their industry. · Second, they should increase their focus on customers, including by soliciting and responding to feedback in an engaging way. · Third, managers should recognize the value of the data collected in their companies’ everyday operations, and ensure that it is managed intelligently and securely. · Finally, the micro-level forces that have the potential to drive segment-wide transformations should be internalized at every level of the company. Companies that apply these guidelines stand a better chance of adapting to what is driving today’s rapid reconfiguration of entire industries. The bottom line, once again, is supply and demand: More than ever, people want – indeed, feel empowered to expect – cheaper, smarter, safer, and more efficient tools to live a more self-directed life. Companies that fail to deliver will find that their days are numbered. What keeps central bankers awake at night? Maybe it is the fear that company chief executives are ignoring their extraordinary efforts to kick-start economies. Low levels of business investment since the collapse of Lehman Brothers are a growing concern in 2015. For central bankers, the worry is that rather than reviving Keynesian “animal spirits”, exceptional monetary policy actions have actually hampered markets’ basic function of financing the expansion of economies. For equity investors, the danger is that surging stock markets have been far too optimistic about growth prospects — and reward those chief executives who hand money back to shareholders rather than those with ambitious, job-creating expansion plans. This week the International Monetary Fund warned that the post-2007 financial crises could have permanently lowered the rate at which economies can expand. Yet on the same day, the IMF provided some comfort for insomniac policymakers and nervous investors in a separate analysis of why private investment fell 25 per cent in advanced economies during 2008 to 2014, compared with forecasts made in early 2007. Rather than suggesting something had gone profoundly wrong with financial markets, the IMF argued the fall could be explained simply as the result of exceptionally weak economic growth. Some negative effects were identified as resulting from high economic uncertainty and weakened banking systems, for instance in southern Europe. Even then, however, the behaviour of companies was not particularly abnormal. What was more, the IMF argued that the current “disconnect” between high share prices and poor real economic growth was not exceptional. Textbook economics would suggest that strong stock markets — the FTSE All World share index is up 150 per cent since early 2009 — should have encouraged an investment boom; with demand for their shares strong, companies should have little problem financing expansion plans. That has clearly not happened, but the IMF analysis maintained that the weak relationship between market valuations and capital spending was not unusual. Striking an even more positive tone, the IMF argued stock markets could instead be leading indicators of future investment trends. “If stocks remain buoyant, investment could eventually pick up,” it concluded optimistically. The implications of the IMF’s research are clear: structural weaknesses in economies should be addressed but QE should be given time to work, with central bankers taking care to prevent a premature rise in real interest rates. For those who have waited patiently for a pick-up in investment, the IMF’s stance might seem far too complacent. It does not discuss what caused output to weaken in the first place beyond noting that “this weakness itself is due to many factors, including financial factors”. One significant financial factor was the collapse in the credit bubble, which prior to the crisis had fuelled unrealistic expectations about future economic growth. Subsequently, investment spending has been curtailed against the backdrop of high debt levels. If that is holding back investment, large injections of liquidity into the financial system via central bank “quantitative easing” are unlikely to make much difference. Aggressive monetary policy will also have little impact if stock market incentives have changed in a way that discourages capital expenditure. Citigroup equity strategists argue that is exactly what has happened. They calculate that global listed companies cut investment by 6 per cent last year — as much as during the financial crisis years — while global dividend payments and share buybacks increased by 15 per cent. “For now, the market wants ‘cash cows’ not capex addicts. CEOs should take note,” a recent Citigroup note concluded. With lower oil prices hitting investment by energy companies, the prospects for a pick-up are not great. The IMF’s view of the post-crisis world is obviously reassuring. Even if it does not herald a sudden improvement, it suggests business leaders are reacting normally and that investment will eventually rebound. But even if right, that could still mean stock markets have become badly disconnected from economic reality. The IMF only considered whether companies were being reasonable — not share markets. 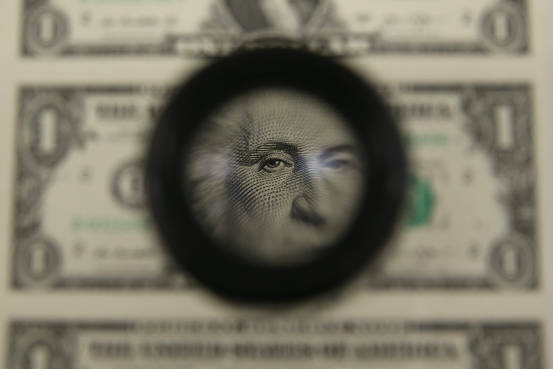 The Treasury Department released its semiannual currency report Thursday. The U.S. Treasury Department on Thursday offered its twice-yearly advice to Europe, Japan, China and other major trading partners, warning they’re not doing enough to support global economic growth. The semi-annual currency report comes ahead of the International Monetary Fund‘s spring meetings, where finance leaders are expected to discuss the global outlook and U.S. Treasury Secretary Jacob Lew will encourage new measures to spur domestic demand. Although GDP growth appears to have slowed in the first quarter of 2015, in part reflecting the temporary effects of severe winter weather, an array of economic indicators suggests that the underlying momentum of the recovery remains intact and growth is expected to remain strong through the end of this year. In contrast to solid U.S. performance, global economic outcomes have been disappointing and remain of concern. Not only has global growth failed to accelerate, but there is worry that the composition of global output is increasingly unbalanced. Weak global growth importantly reflects an insufficiently comprehensive mix of macroeconomic policies in some key countries, which leaves substantial scope for efforts to support domestic demand. Policymakers need to use all levers, including fiscal stimulus where fiscal space exists, to complement monetary policy accommodation. In conjunction, many countries also need to implement structural reforms to help boost potential growth and address persistent stagnation. Balanced approaches to macroeconomic policy are particularly needed in large surplus countries, notably in Germany, China, Japan, and Korea. The key priority for the euro area is to bolster domestic demand growth. In the face of ongoing disinflation, the European Central Bank (ECB) has taken forceful steps to support growth and combat downward price pressures. Complementing these monetary measures with supportive national fiscal policies, and appropriate structural reforms, would help deliver the strongest boost to domestic demand. Stronger demand growth in Germany is absolutely essential, as it has been persistently weak. Germany’s relatively low unemployment and recovery to pre-crisis output has relied heavily on increased exports outside the euro area. Going forward the government needs to deploy all three policy levers – fiscal, monetary, and structural – to secure a balanced and durable recovery and ensure monetary stimulus is appropriately supporting the growth of domestic demand. Overreliance on monetary policy without appropriate support from fiscal policy and structural reforms will put Japan’s recovery and escape from deflation at risk and could generate negative spillovers. China’s currency needs to appreciate to bring about the necessary internal rebalancing toward household consumption that is a key goal of the government’s reform plans and necessary for sustained, balanced global growth. While China has made real progress, with its real effective exchange rate appreciating meaningfully over the past six months, these factors indicate an RMB exchange rate that remains significantly undervalued. After reducing their presence in the foreign exchange market from August through November, Korean authorities appear to have substantially increased intervention in December and January, a time of appreciation pressure on the won. Refraining from intervention and allowing more space for won appreciation would help with rebalancing and encourage a reallocation of productive resources to the non-tradables sector. For what it’s worth, the agency’s case looks convincingly laid out and seems to contain all the elements of proving price manipulation, including intent and the ability to control prices. That said, the Commission has a very poor record of prevailing in the manipulation cases it has brought. Yes, Director Goelman is correct; the core of the agency’s mission is to protect public market participants from manipulation and abusive trade practices that undermine the integrity of derivatives markets. And no, a market participant not happy with cash prices may not artificially lower those prices to secure physical supplies. Wait a minute – isn’t that exactly what I’ve alleged JPMorgan has done and is doing in silver, namely, shorting on the COMEX in order to scoop up physical silver at bargain basement prices? Haven’t I been writing this two times a week for a very long time? (In the interest of full disclosure, I have sent Director Goelman every article I’ve written since he has been the agency’s enforcement director). In fact, I’ve based my allegations about what JPMorgan has done in silver primarily on the agency’s own public data and that from the exchange (COMEX) and other public sources. The CFTC’s case against Kraft is derived from private trading records and internal emails. Further, there is a bit of complexity in the agency’s case against Kraft, in that the company’s trading strategy involved buying futures contracts in order to impact the basis (the price differential between futures and cash grain prices) and lower the cash price. With JPMorgan, there is no complexity as this crooked bank has used futures market short sales to depress the price of silver in order to buy physical silver at artificially cheap prices. Importantly, the Commission’s case against Kraft most likely came as a result of a complaint from a disgruntled insider who was damaged by Kraft’s futures market activity and not as a result of widespread complaints or damage to the public. To my knowledge, this was not a case publicly discussed prior to the charges being filed. Compare that to silver, where many thousands of market participants and observers have petitioned the agency for years about the manipulation by JPMorgan and where investors and silver producers have been and are being damaged by artificially depressed silver prices. The unmistakable conclusion is that this agency is bought and paid for or otherwise not acting in the public’s best interest. For a federal agency, I don’t think there is a more serious allegation. So the real question is why the selective prosecution of the law? Why is the CFTC going after Kraft on a complicated case with an alleged payoff that looks like chump change (around $5 million total profit to Kraft), when public data indicate JPMorgan shorts the silver market whenever prices rise to cap and drive prices lower in order to profit on those short sales and accumulate silver at unfairly low prices; with JPM’s cumulative illicit take running into the hundreds of millions if not billions of dollars? I can see the agency going after Kraft, but I can’t see any legitimate reason for it not to go after JPMorgan for the far more egregious silver activities the bank is involved in. Worse, why won’t the agency explain why the public data doesn’t point to JPMorgan doing what I allege the bank is doing? Can the Commission refute that JPMorgan has been the big concentrated short seller in COMEX silver futures since acquiring Bear Stearns in early 2008 and has been accumulating physical silver while remaining short COMEX futures for the past four years? That’s the key, no one - not the CFTC, not JPMorgan, not the CME – can offer a reasonable explanation for JPM’s control and manipulation of the silver market and what has transpired these past seven years. Beyond the shadow of any doubt, the CFTC knows what price manipulation is; otherwise it never would or could have charged Kraft. So how can the agency see it with Kraft in wheat and not with JPMorgan in silver? Why is JPMorgan above the law? I think it’s because the bank was given a “get out of jail card” for agreeing to take over Bear Stearns and its massive short positions in silver and gold in 2008 at the US Government’s request. Since then, JPMorgan has exploited the arrangement in suppressing the price of silver and accumulating physical silver under fair market value. The problem with selective enforcement of the law is that it undermines and makes a mockery of the whole system. It is a betrayal of the highest order. Yes, I’m fairly sure that the free pass to JPMorgan to allow it to continue the silver manipulation was given by Treasury and Federal Reserve officials to preserve market order and was considered to be to the public’s benefit. But look at what it has morphed into seven years later – a market more distorted than ever before and in which JPMorgan has amassed the largest hoard of silver in history. I would remind you that the Enforcement Division (before Goleman arrived) even took five years to supposedly formally investigate JPMorgan’s concentrated short position in silver and ended that investigation without ever addressing the issues. Shame on all involved at the time, most particularly the two who knew better, former chairman Gensler and Commissioner Chilton. Now the shame has been passed to those currently in charge. It is my understanding that all senior officials at the agency swear an oath of office to uphold the law. Clearly, the law is not being upheld in silver or with JPMorgan. I don’t know how the senior officials of the agency can live with themselves considering their extreme dereliction of duty to the law and their betrayal to the citizens of this country. I know these are very strong accusations and I do not make them lightly. And to be fair, I would be happy to amend them if any reasonable explanation were forthcoming, although that is unlikely. There are many problems for the world and for the US and the ongoing silver manipulation may not rank high in most minds. However, anytime basic law is perverted it diminishes us all. And such a perversion is self-evident in silver. I know that if someone accused me of doing something seriously wrong and the accusations were unfounded, I would respond forthwith, as I’m sure would anyone. I’m accusing the CFTC and, specifically, Enforcement Director Goelman and his staff of dereliction of duty and the selective application of the law that all swore to uphold. To my mind, the refusal to apply commodity law evenly and protect the public is almost treasonous in nature. Of course, should a cogent alternative explanation be issued by the Commission or the Enforcement Director explaining the role of JPMorgan in the silver market in legitimate terms, I will retract my statement and offer a public apology. This is a serious matter – open and unqualified allegations of market manipulation by the nation’s most important banking institution and the failure of the regulators to deal with that manipulation or explain why the allegations are unfounded. Since the silver manipulation has become so clear (with the recent COT reports and JPM’s continued physical accumulation), I can’t help but feel we are close to the critical point where the enough outsiders recognize the scam JPMorgan has been running and the regulators’ illegal cover up of that scam. I know without a doubt that silver is artificially depressed in price by JPMorgan and other collusive commercial traders on the COMEX and as this story is discovered a wave of physical buying must occur. Silver (and gold) investors and producers are being damaged by the continued price fixing on the COMEX. Because the evidence of manipulation is increasingly obvious it is appropriate to demand that the regulators treat silver and gold in the same manner as they regulate other markets. Or explain why they shouldn’t. If you agree that there is something fundamentally wrong with the Enforcement Division’s double standard in the Kraft wheat case versus the JPMorgan silver case, please take the time to contact Director Goelman. Ask him to charge JPMorgan with manipulation or at least for him to explain how it could be OK for the bank to accept physical delivery on the maximum number of COMEX silver contracts while holding a massive net short position in silver futures. Not how it could be done – how it could be OK. There have been a few developments recently which could prove bullish for gold. 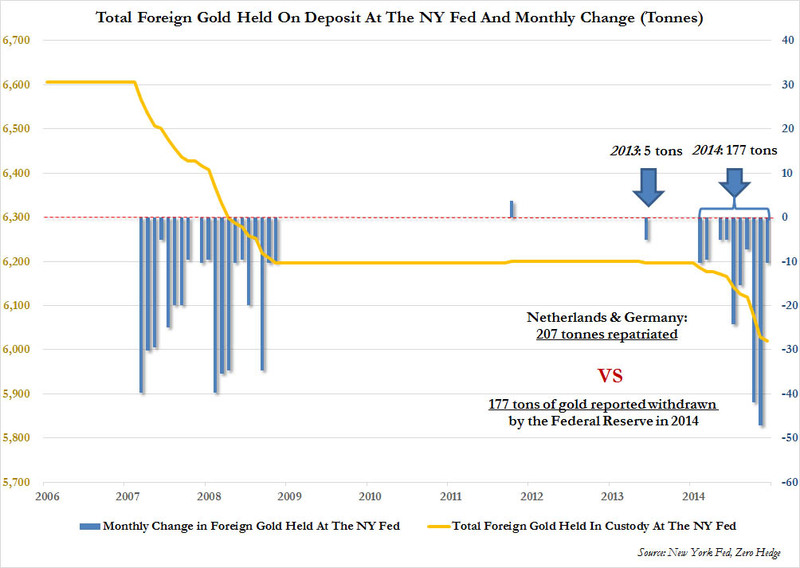 Foreign central banks resumed repatriating gold, with The Netherlands and Germany repatriating a total of 207 tons last year. The official numbers from the Federal Reserve state that only 177 tons were repatriated last year. It's uncertain what is causing the discrepancy but it could indicate market tightness. Goldman Sachs predicts that gold production will decline going forward with the world's gold reserves declining to zero in approximately twenty years. This could tighten the gold supply-demand balance and thus push prices up. Over the past several weeks, there have been a number of developments globally that could prove to be quite bullish for gold. However, the market price of gold has not yet moved to reflect this reality. Instead, gold continues to trade in the same range that it has held since the price of the yellow metal plummeted back in 2013. This could represent an opportunity to investors to begin or continue accumulating gold. The withdrawals by Germany and the Netherlands alone should have reduced the Federal Reserve's foreign gold on deposit by at least 207 tons. But for some reason this did not happen. While it is uncertain exactly what this means at present (if anything), it could be a sign that the physical gold market is much tighter than the market believes. It is interesting to note that the Federal Reserve has not revised its official numbers to correct this discrepancy. However, it does state that the withdrawals of gold have continued this year. 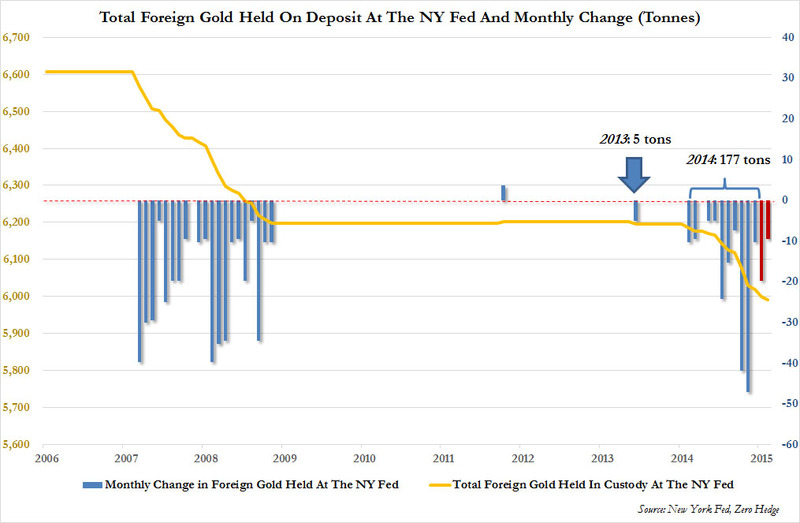 According to the most current data published by the Federal Reserve, a total of thirty tons of gold were withdrawn from its vaults in the past two months, with twenty tons being withdrawn in January and ten tons being withdrawn in February. It is possible that this thirty tons is simply the delayed delivery of the unaccounted for gold discussed earlier, but this is not certain. If it is, then it is an indication that the Federal Reserve has imposed a settlement period for physical gold for some reason as both the central banks of Germany and the Netherlands stated that they actually received their gold in 2014. This could be, once again, an indication that the physical gold markets are much tighter than the market reflects. The reductions in the Federal Reserve's holdings of foreign gold could also be an indication that the Bundesbank or some other central bank continues to repatriate its gold. In fact, this seems likely. 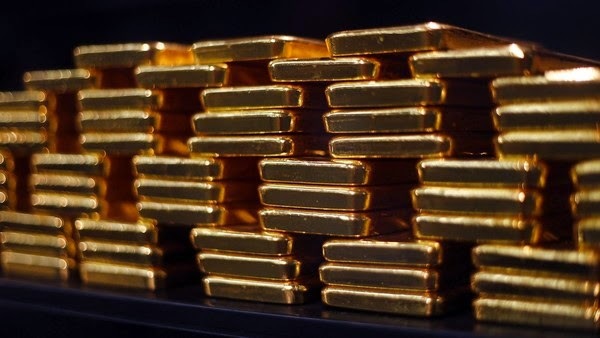 At the end of last year, the Bundesbank stated that it intends to repatriate an additional 210 tons of gold from the gold vaults at the New York Fed. Therefore, the reported withdrawal numbers could be this process continuing. One of the reasons why gold has been a highly valued metal is its rarity. Unfortunately, it may be about to get much more rare. According to Eugene King at Goldman Sachs, the world's total reserves of gold in the ground may be depleted in as few as twenty years. 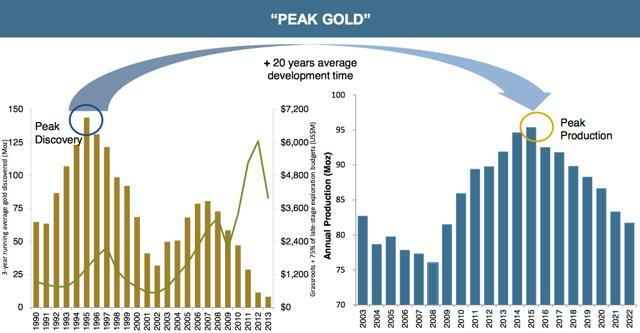 Discoveries of new mineable gold deposits peaked in 1995 at around 140 million ounces and have been declining ever since then. In 2013, only ten million ounces of new gold reserves were discovered. Meanwhile, Goldcorp (NYSE:GG), one of the largest gold producers in the world, predicts that total global production of gold will peak this year and then begin to decline. This should prove to be bullish for gold prices as the supply of new gold steadily declines going forward, barring a decline in demand, which seems unlikely. Consumers of gold, such as jewelry makers, have begun to take steps to protect their gold supply. On April 6, 2015, OilPrice.com reported that Rajesh Exports, the largest jewelry maker in India, is actively looking to purchase gold mines in Australia for this purpose. Rajesh Exports is one of the largest consumers of gold in the world, single-handedly consuming approximately 140 tons of gold annually. There is little reason for the company to be actively looking to acquire gold mines unless it had reason to believe that gold will become more scarce going forward, as Goldman Sachs predicted. This therefore lends further support to our bullish thesis for gold. Central banks around the world are busy resurrecting global bubbles to fight off global deflation. But the Fed is signaling a divergence, ready to start raising rates despite lackluster economic data. Is it time to really worry about stock and bond market bubbles? I don't think so but read why investors need to be vigilant in this environment. The consensus on Wall Street is that stocks will continue to rise ... until they stop. So the question now is: What can stop the market's bull run? This is especially pertinent in light of Monday's surge. The Dow Jones Industrial Average gained a whopping 264 points to close at 17,976. This was the biggest increase in eight weeks. the Federal Reserve might - but a rate increase is already priced into the market. That said, our central bank has been supporting the stock market to an unprecedented degree since the economy took a tumble a number of years ago, so any increase in rates might have some unexpected side effects. Keep an eye on corporate profits. Expectations for earnings in the first quarter, which is now coming to a close, are not high to begin with. Most analysts are looking for little or no growth compared with last year. But even these estimates could wind up being too optimistic, since many assume that the economy grew by 2% or more in the first quarter. But as I said in my column of March 3, the severe weather may have reduced the first quarter's rate of economic growth by a percentage point or more. That could take a big toll on profits. For example, if first-quarter earnings fell from their year-earlier levels, it would be the first four-quarter drop in six years. What really makes traders nervous is that this market has not had a 10% correction in three years. The stock market's rise last year was the sixth annual gain and the longest skein since 1999. Stocks have risen this fast in six years only twice before: in 1993-99 and 1923-29. Both instances were followed by a bear market and a recession. Until this happens, party on! There are an unusual number of articles on stock and bond market bubbles popping up everywhere, which basically tells me things are getting bubbly all around the world, not just the United States. The bubble that worries me the most is the China bubble. Bloomberg just published an article on how the world-beating surge in Chinese technology stocks is making the heady days of the dot-com bubble look tame by comparison. Nothing like a billion people speculating on Chinese tech stocks to drive up shares to the stratosphere! No wonder China bears are throwing in the towel. The bubbles, or supposed bubbles, that worry me the least? The buyback and biotech bubbles everyone is fretting about as well as the bond bubble that Julian Robertson is worried about. He should listen to the new bond king, DoubleLine's Jeffrey Gundlach, to understand why this time is really different. 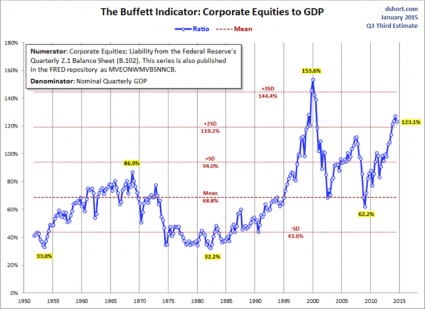 The only problem with "The Buffett Indicator" is that the Oracle of Omaha ignores it and recently stated in a CNN interview that stocks "might be a little on the high side now, but they've not gone into bubble territory." So why are people so nervous? Well, there are a lot of reasons to worry but I think a lot of underperforming hedgies, financing blogs like Zero Edge which endlessly warns us of impending doom and gloom, have just read the macro environment wrong after the 2008 crisis. And they still don't understand that central banks around the world will continue to fight global deflation at all cost even if that means resurrecting global bubbles. Go back to read my comment on unwinding the mother of all carry trades, it's still alive and well. And as Sober Look notes in another excellent comment, demand for dollar funding in the eurozone is likely to remain elevated as the area provides extraordinarily cheap financing while access to quality fixed income product has become increasingly limited. This just means the mighty greenback will keep surging. So now all eyes are on the Fed. New York Federal Reserve President William Dudley said on Wednesday the Fed could still hike rates in June despite a weak start to the year if economic data pick up over the next two months. Sure, if the economic data improve over the next couple of months the Fed will likely raise rates in June, but I agree with those who say it will be making a monumental mistake if it opens this window prematurely. Moreover, I agree with Brian Romanchuk of the Bond Economics blog, the Employment Situation Report for March was at best mediocre and there is no reason for the Fed to hike rates this year. But don't discount a major policy blunder from the Federal Reserve, which will wrongly interpret domestic and international data as a lot stronger than they truly are. That's what worries me and this is why I fear that deflation will eventually come to America, wreaking havoc on 401(k)s and private and public pensions. Despite all these concerns, I'm sticking to my Outlook 2015, knowing full well that even though it will be a rough and tumble year, the opportunities still lie in small caps (NYSEARCA:IWM), technology (QQQ and XLK) and biotech shares (IBB and XBI) and the risks still lie in energy (NYSEARCA:XLE), materials (NYSEARCA:XLB) and commodities (NYSEARCA:GSG). A little warning to all of you playing the monster breakouts in iShares China Large-Cap (NYSEARCA:FXI) and iShares MSCI Emerging Markets (NYSEARCA:EEM). Don't overstay your welcome no matter how tempting it might be thinking there is a global economic recovery underway. If the Fed does raise rates this summer, these markets will get clobbered. Below, Tiger Management chairman and co-founder, Julian Robertson discusses the U.S. economy and bond bubbles. Mr. Roberston also thinks the U.S. dollar will continue to strengthen (second clip), which in my opinion buys the Fed time to stay put. Also, while the Federal Reserve contemplates increasing interest rates, former Clinton Treasury Secretary Larry Summers said Thursday that policymakers should be more concerned about acting too early than acting too late. Finally, take the time to listen to a discussion I had last week with Gordon T. Long of The Financial Repression Authority. I cover a lot of topics that others typically ignore, including how pension poverty is deflationary and will keep rates low for a very long time.